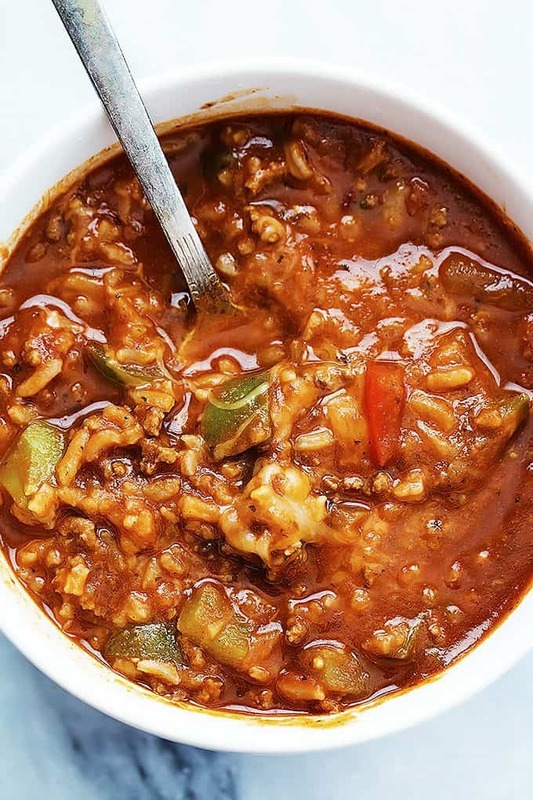 Hearty 30-minute Stuffed Pepper Soup! Easy to make and chock-full of flavor! Happy SoupDay!!! Oh I mean Sunday. Happy Sunday. But lets put that on the shelf for a quick second and discuss leaves. Fallen leaves. A LOT of crispy autumn fallen leaves. Yesterday our entire yard, the whole thing, was completely blanketed in fallen autumn leaves. I am not exaggerating (what? I never exaggerate…) when I say that we couldn’t see an inch of grass in our yard, it was nothing but leaves. A whole carpet of it. And my poor husband spend the whole day trying to clean them up. I mean they’re pretty, don’t get me wrong! But we live in Utah. Where it snows. Have you ever tried to clean up wet leaves? Or better yet, frozen ones? Normally we’d spend several weekends trying to get the mess cleaned up but next weekend we are blessing the twins with 50 guests to feed (read: I am feeling overwhelmed) and then the following day we are headed down south for a couple of weeks. I wish I could say we were going somewhere tropical but Southern Utah is about as close as we are going to get. I also wish I could say it was for a vacation but it’s for my husband’s work. But still. It’s almost always warmer down there than it is up here so I’m on board y’all. Here it’s been frigid. Admittedly, I get chilled easily, it’s true. I wear sweats all year round and my fingers are nearly always icy. But it has been cold lately by just about anyone’s standards and there’s nothing that sounds better to me on a cold November day than a big bowl of hearty, savory soup. 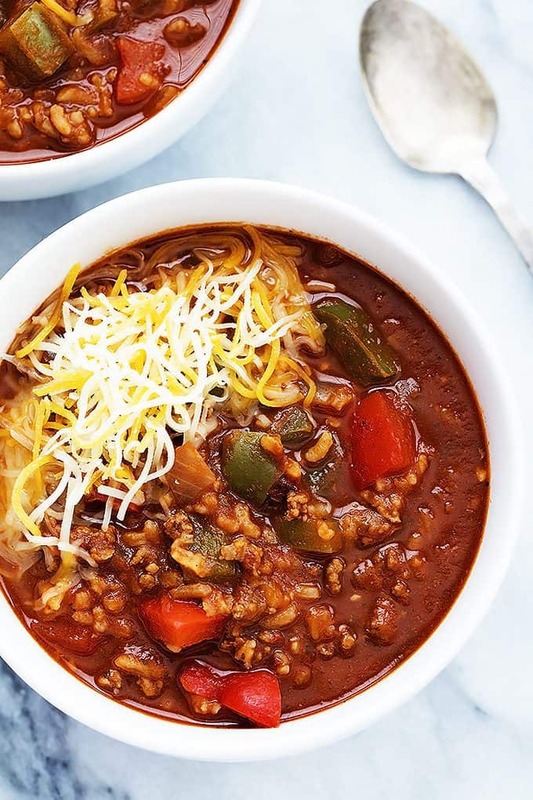 This stuffed pepper soup is pretty much exactly what you’d thing it was from reading the title: everything you love about a cheesy stuffed pepper in the form of a warm-you-up comforting soup. And it’s quick and easy parcheesy – just 30 minutes start to finish and just one pot to clean up! Add ground beef, diced onion, garlic, and olive oil to a large stock pot. Saute over medium heat 2-3 minutes until fragrant and onions are tender. 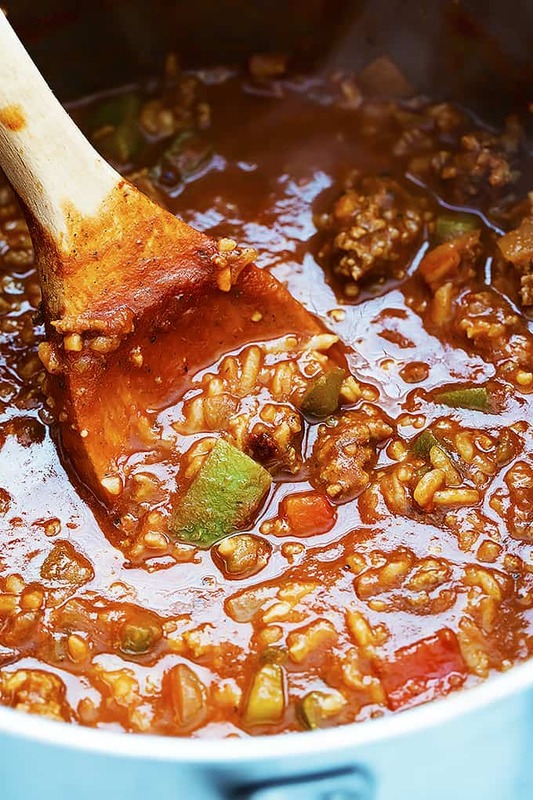 Add beef broth, tomato sauce, cajun seasoning, bell peppers and rice and simmer on medium-low heat for 20 minutes. Taste and add salt and pepper to taste if desired. Top with shredded cheese and serve hot. 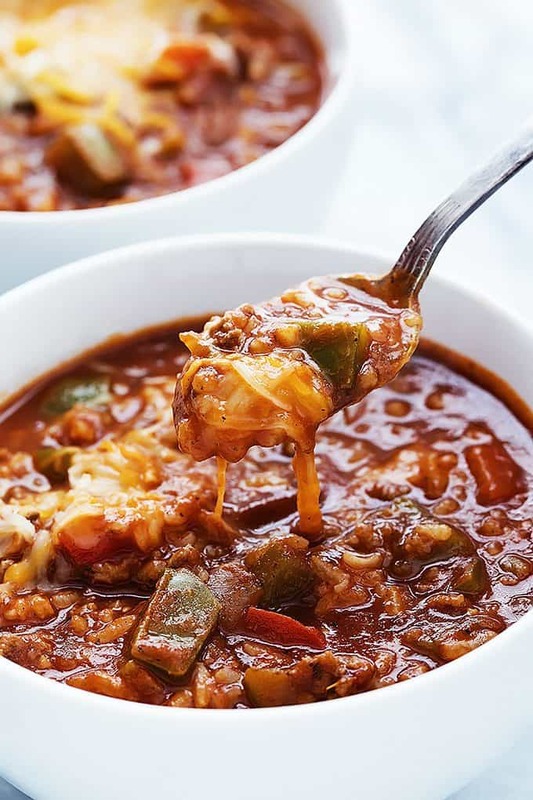 Try these other hearty soups for winter! What a gorgeous soup! Perfect for cool fall evenings! When do you add the beef broth? Step 2? Hi Candice! So sorry for the confusion , the broth goes in with the tomato sauce! How would you make it without minute rice? This recipe calls for regular rice. The recipe says minute rice. Is it minute rice or regular rice? Thanks! Just wanted to let you know the recipe actually lists “¾ cup minute rice, uncooked” so I was wondering the same. I would imagine regular rice might need a bit longer to cook than ~20 mins. Can’t wait to make this, though! This is something I’ve been thinking about lately……….we like stuffed peppers. This gives all the flavor, but easier. The cajun spices will up the flavor, plus I’ll also add paprika and a bit of liquid smoke. I will use brown rice. Thank you!! Hi! I’m making this yummy soup now and the instructions don’t say when to add the beef broth. Thanks! Hi Tara! I’m SO sorry, the broth goes in with the tomato sauce – I’ve updated the recipe! Again, so sorry for the confusion! I was curious, the ingredients lists 4 cups of beef broth in the recipe, but the instructions don’t mention anything about the broth. Is that a mistake in the ingredients or was it left out of the instructions by accident? Hi Bailee – I’m so sorry for the confusion it was a typo on my part, the broth goes in with the tomato sauce! What am I supposed to do with the beef broth? It doesn’t say in the instructions. Hey, What color peppers do you recommend with this soup? Thank you so much for the recipe! I’ve been making the traditional Armenian stuffed peppers for years, but the soup is so much easier and just as tasty! I never knew this was also considered a Mexican dish! Holy Moly this made a ton! Barley fit in my large dutch oven. 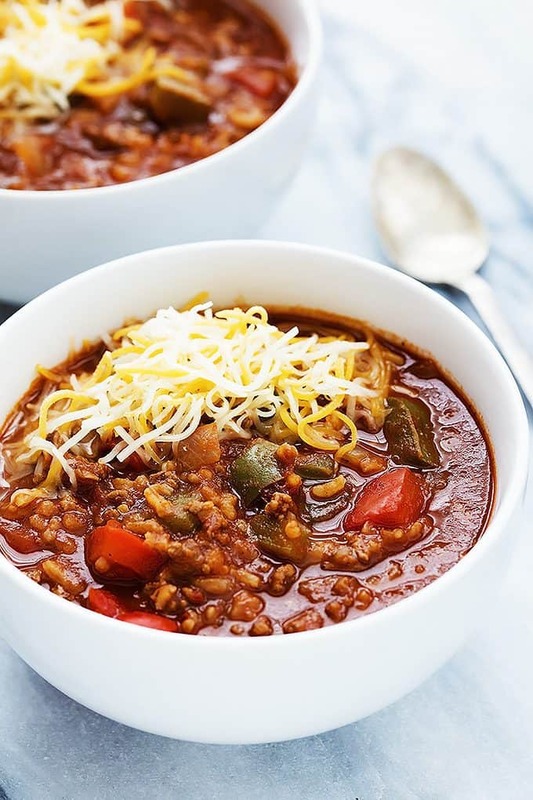 Hello Tiffany,Thnx for your delicious recipes.I’ve found those on Pinterest and i am planning to make this mouthwatering looking soup,but i have an question on one of the ingredients.I don’t know what an Bell Pepper is.I live in Belgium and i have allready heard of it but still don’t know what it is. Hi! A Bell pepper is a ”poivron”, un piment ordinaire. Pas un piment fort. The recipe says use minute rice but one of your comments says regular rice. Is it minute rice or regular rice? Looks yummy and have all the ingredients and am anxious to fix it! Thanks! Great recipe! The whole family loved it. I added soMe QUINOA and yummy was it good!! That sounds SO delicious! Great idea. Thanks for sharing!